So what did you do at work this week? Some people might see Friday as a good day to reflect on what they have achieved at work this week. Others are just looking forward to the weekend. As we prepare our training room for this weekends paediatric first aid course [that’s how some of our team are spending this weekend], laying out the kit for our delegates to practice their life saving skills, we starting talking about what had we done this week, month and so far this year. We’re not normally that philosophical on Fridays, but that’s what happened. The conversation turned to the merits [or not] of working weekends. With many of our training team having worked in the emergency services, weekend working isn’t new territory, but we appreciate that for some of delegates it’s not welcome news! The achievement we’re most proud of is the number of people we are introducing to life savings skills. In February 2016 we trained 248 people in first aid, 232 in January. So that is a total of 480 people prepared to save a life and it’s only the beginning of March! In many ways we hope none of these “480” ever need to use their life saving skills, but the law of averages means that someone, will use some of their life saving skills at some point. If you live in South Essex you can’t help but hear about Lazarus Training at the moment! 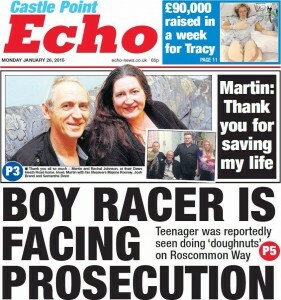 We were recently covering in the local papers, [including the Evening Echo], after some members of our team had to perform CPR in our workplace. On 4th March we were presented with cupcakes by Southend Radio as part of their “Treat your team” promotion and we are also featured in an article in the March edition of “Your Essex” the free local guide. Earlier this year Martin [who works next door to our Leigh on Sea training office] was taken ill at work. He was having a heart attack and went into cardiac arrest [where the heart stops pumping blood]. Luckily Sam from our admin team was nearby and with some help for other great people she was able to summon help, perform CPR and control the situation until the ambulance arrived. We’re glad to say that Martin has made a good recovery and the story was featured in the Evening Echo [pictured]. It’s great to be able to point people on our first aid courses to a real life example of a workplace emergency where basic first aid has saved a life. From print to the airwaves, there is no escape from Lazarus Training in the media! 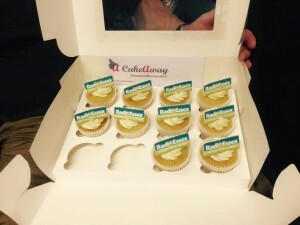 Our local radio station Southend Radio has a feature in which they ‘award” a box of cupcakes to a local company to “Treat your team” and earlier this week it was us! Samantha submitted our details, but Claire and Alison were the lucky recipients when the cupcakes arrived. And as you can see they started disappearing so quickly we couldn’t even get a photo of the complete box! As part of this feature Claire even took to the air and chatted for a few minutes about the first aid and fire safety training Lazarus Training delivers. Those of you living in Essex may also see us in the “Your Essex” magazine as Martin [mentioned above] describes the events of that fateful day at our first aid training venue in South Essex. You might have also seen some of our team and some of equipment in TV programmes in the last few months, with guest appearances on BBC’s “Trust me I’m a Doctor” and our equipment being given a bit of a rough time in BBC’s Top Gear recently. On a normal school day, most parents will drop their children off at school confident that their welfare will be catered for. Amongest the many welfare needs covered by the school will be provision for emergency first aid in event of an emergency. 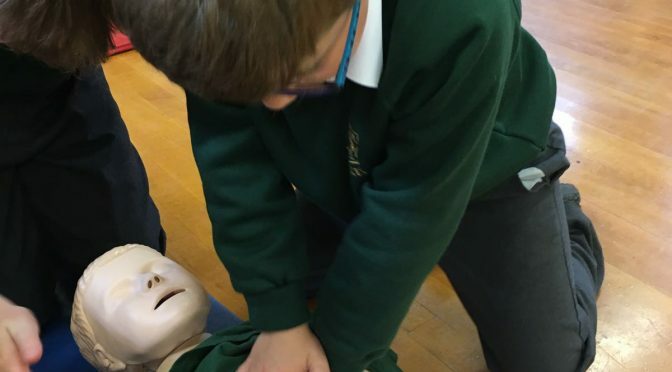 Most schools will have staff trained to various levels, such as Emergency First Aid at Work or with reception classes Paediatric first aid, all covering the basics of keeping a child alive until professional medical care arrives. Many courses also cover the more mundane bangs and blows of the playground, thankfully the more common of the two scenarios. 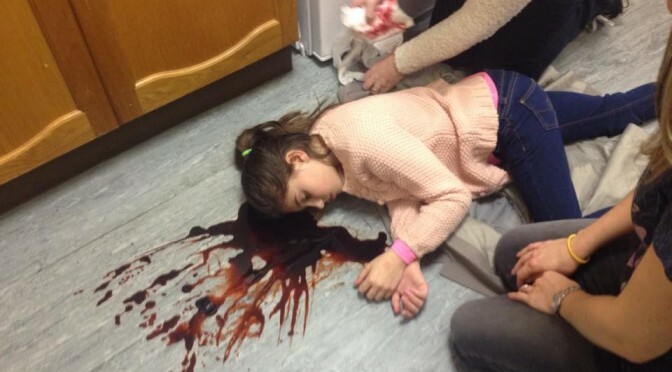 But come the school holidays, what first aid provision is provided for your children? Many parents will have received first aid training via their workplace, some will have attended first aid training when their child was a baby, but as the child grows and becomes more adventurous many parents let their first aid knowledge slide. One quick easy fix is to access some online learning, the easiest being via Youtube, which contains countless videos on key topics such as CPR and the recovery postion. Just ensure you find one which relates to the area in which you live. If you wish to take it further many first aid training organisations offer short first aid courses aimed at parents, typically running for 3 hours or shorter. Missed our previous free paediatric CPR sessions? Don’t worry more are scheduled. The next being 12th January 2012 in Southend on Sea. More details [including a map] are available on our Facebook page. 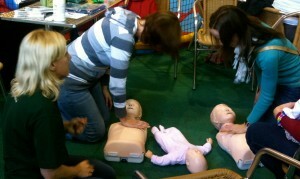 Our series of free CPR practice sessions continues, proving to be very popular. The “drop in” nature of the sessions means that you can come along and learn some basic, but potentially life saving, skills or if already trained just have a practice. At Lazarus Training we know how busy everyone is, so we bring the sessions to you, running them in play centres, gyms, workplaces and activity centres. Running the courses in these places makes them very informal, so if you see us don’t hesitate to come over and say hello. 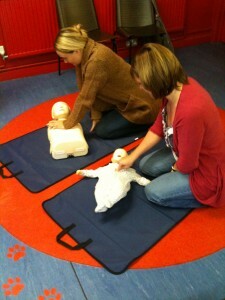 If you would to discuss arranging a similar event or any first aid training just call us on 0800 242 5210.